BCC Research reports that an expanding population of patients with prostate cancer, the increasing demand for treatment, and emerging technologies are contributing to growth of the global prostate cancer market. Valued at $47.2 billion in 2016, this market is estimated to reach $65.1 billion by 2021 at a compound annual growth rate of 6.6%. 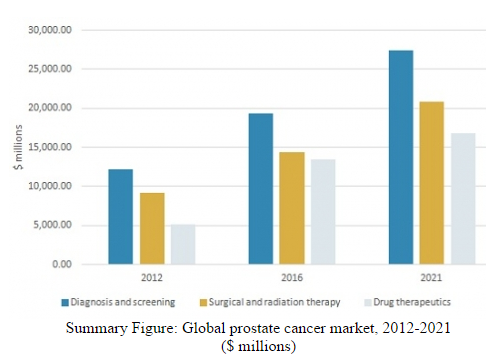 BCC Research’s study, Prevention and Treatment of Prostate Cancer: Technologies and Global Markets, reveals that market growth is expected in the United States, Europe, Japan, Brazil, and Canada as the result of new products entering the market. The expected launch and adoption of innovative therapeutics will enable the entry of new companies to the market and significantly push its expansion. The United States is predicted to be the largest and fastest-growing geographic segment from 2016 to 2021, followed by Europe. Surgery and radiotherapy are often curative when treatment is indicated for localized disease, with androgen deprivation therapy being the standard of first-line care. However, most patients ultimately develop resistant disease, for whom treatment options have been limited. Docetaxel has been the standard treatment in these cases. Prostate cancer cells depend on signaling through the androgen receptor to grow and survive. Many anticancer therapies that target androgen receptors are initially successful in patients, including a class of drugs known as CYP17A1 inhibitors, which interfere with androgen receptor signaling by blocking the synthesis of androgen. However, over time, adaptations to androgen receptor expression and function lead to treatment resistance and disease relapse. Castration-resistant prostate cancer, also called hormone-sensitive prostate cancer, is disease that recurs or progresses despite first-line androgen deprivation therapy. Recently, the observation that a CYP17A1 inhibitor, seviteronel, effectively treated a patient’s prostate cancer without actually lowering androgen levels led Duke University researchers to further investigate the drug’s therapeutic activity. In a study published May 2 in Journal of Clinical Investigation, the team found that many CYP17A1 inhibitors also function as competitive androgen receptor antagonists, indicating a more complex and potentially more effective role for the drug in treating prostate cancer. The researchers then demonstrated that CYP17A1 inhibitors acting at androgen receptors can inhibit the growth of prostate tumor cells expressing a treatment-resistant androgen receptor mutation. These findings provide insights into a mechanism that may lead to the development of more effective therapies for treatment-resistant prostate cancer. Epic Sciences recently completed a $40 million Series D financing. Epic is developing a portfolio of liquid biopsies that predict drug response in cancer, and recently partnered with Genomic Health to commercialize the OncotypeDx AR-V7 Nucleus Detect test. Epic has published data in JAMA Oncology and European Urology on the OncotypeDX AR-V7 Nucleus Detect test in metastatic castration-resistant prostate cancer. These data show that patients with detectable levels of AR-V7–positive circulating tumor cells in their blood had significantly better clinical outcomes when treated with taxane chemotherapy than more expensive targeted therapies. Patients with the AR-V7 biomarker may display resistance to an androgen-directed therapeutic. Once Epic’s test is commercialized, it will help physicians and patients decide when to proceed with taxane chemotherapy (i.e., in patients for whom there is no potential benefit of receiving an androgen-directed therapeutic) or androgen-directed therapeutics. It is estimated that each year, approximately 50,000 patients with metastatic castration-resistant prostate cancer could benefit from knowing their AR-V7 status before selecting further treatment. Last month, ASCO released a provisional clinical opinion that focuses on the use of second-line hormonal therapy for chemotherapy-naïve men with castration-resistant prostate cancer. The goal for the treatment of castration-resistant prostate cancer is palliation and avoidance of chemotherapy. Results from clinical trials have shown that various second-line treatments slow cancer growth and lead to a better quality of life. Therefore, Virgo and her colleagues conducted a systematic review of six Phase III randomized controlled trials conducted between 2000 and 2014 to update the ASCO guidelines. The provisional clinical opinion states that for men with castration-resistant prostate cancer, a castrate state should be maintained indefinitely. Second-line hormonal therapy (e.g., antiandrogens, CYP17 inhibitors) may be considered in patients with nonmetastatic CRPC at high risk for metastatic disease, but otherwise is not suggested. The full PCO was published in Journal of Clinical Oncology. Despite the changing landscape of therapy, data are still limited and challenges remain for clinicians on how to manage and treat patients.